Canada’s Anti-Islamophobia Motion A Shining Example To The World. On Oct. 26 2016, the House of Commons, Canada’s Parliament, adopted unanimously a motion to condemn all forms of Islamophobia in the country. The fact that the motion received no objection from any of the federal parties shows that the Liberal, NDP, Conservative and Bloc Quebecois members have a clear understanding that Islamophobia is a severe form of bigotry and is not a simple subject that can be ignored anymore. It has become a critical illness that raises concerns and requires a forceful push back from the federal legislators that represent all Canadians to denounce Islamophobia. Canada, united in standing up for human values, will be on record as the first country in the Western world to adopt a motion that contains clear wordings expressing denunciation of any sort of bigotry towards citizens based on their religious and cultural background. This move has sent a strong message to xenophobes that their acts of violence, whether verbal, moral or physical, have been rejected, and that their beliefs stand against everything that Canada prides itself on: inclusion, equality and peace. Moreover, Canada can now be provided as an actual example to the world that nations are stronger through the diversity of their population. This move has sent a strong message to xenophobes that their acts of violence, whether verbal, moral or physical, have been rejected. It’s rational to say that the notion of inclusion of all people that share a common land within an identified border is the most effective tool and approach to secure peace, harmony, equality and fairness. Democratic states have carried titles of freedom, liberty and human rights slogans for a long period of time. We have been witnessing for the last two decades or so that some governments try or adapt official policies that lead to social friction amongst cultural, religious or ethnic lines. These strategies, despite appearing to be pay off through some political gains for a very limited period of time, certainly will end in devastating consequences that lead to social tensions that can be easily avoided. By the same token, exclusion of groups of citizens because of their social, spiritual or intellectual convictions, skin colour or political views may lead to feelings of isolation and negligence, especially in the youth segment of society. This may lead some of youth to turn to inappropriate actions, creating a generation that is looked at and dealt with as second-class citizens and under siege at all times. Canada has proudly taken a step in enhancing human values. Anti-Semitism, racial profiling, islamophobia, bashing of any culture or race are all characteristics of bigots and portraits of racists. They are the individuals who rush to express their hatred and hostility toward any inclusive move and mind-opening exchange toward citizens of all faith, beliefs and views. Societies across the universe have suffered at the hands of these extremists elements that target all those who do not belong to their line of philosophy. Canada has proudly taken a step in enhancing human values by condemning Islamophobia. The concepts of hate speech, bigotry and stereotyping have received a blow from the moral gesture taken by the House of Commons, the house that represents citizens from coast to coast, in unanimous consent without the opposition of any of the legislators on the floor. The next step is for the federal government to set up policies and orientations to address and deal profoundly at all levels, social, economical and political, with Islamophobia symptoms that present themselves strongly in our society. Canada is exceptional in its values and human standards, and can remain the multicultural icon of the world with the continued condemning of bigotry. 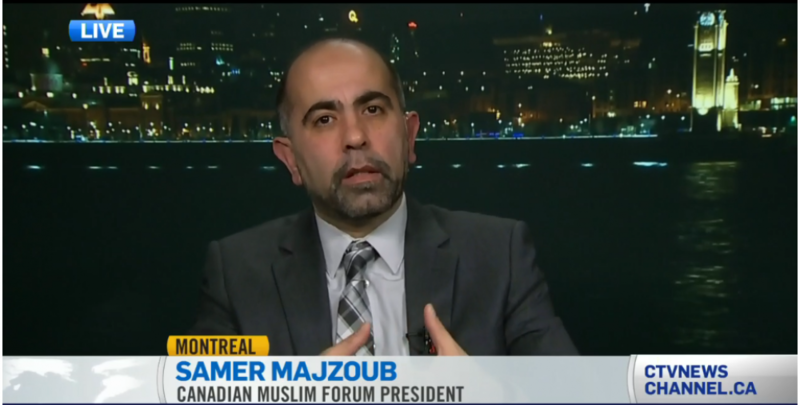 Samer Majzoub is the president of the Canadian Muslim Forum (FMC-CMF). This entry was posted in article and tagged (FMC-CMF), Anti-Islamophobia Motion, Bloc Quebecois, Canada Muslims, Canadian Muslim Forum, Conservatives, Forum Musulman Canadien, House of Commons, Islamphobia, Justin Trudeau, NDP, petition e-411, Samer Majzoub, Thomas Mulcair by samermajzoub. Bookmark the permalink.